SHOP OUR SPRING SALE NOW! As such, CuttingBoard.com is offering our Spring Sale! Many of our best sellers are going for 10%, 20% even 30% off retail price! Plus, take another 5% off your entire order by using the coupon code "SPRINGSALE" (no quotes) during checkout or on the cart page. Big savings is big smiles for all you chefs at home, so don't wait, this sale ends on March 31st! 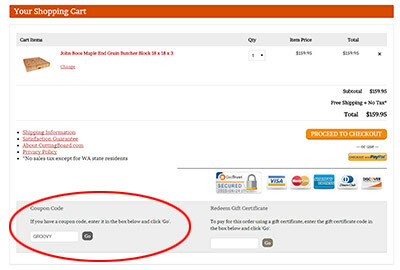 Below is a screenshot of where to enter in your coupon on the checkout page. Click on the "Go" button after typing in your coupon code "SPRINGSALE" (again, no quotes). Note promotions do not stack, so only one coupon / promotion per customer, per sale. Once you have clicked on the "Go" button, a message will display indicating the coupon was successfully applied.